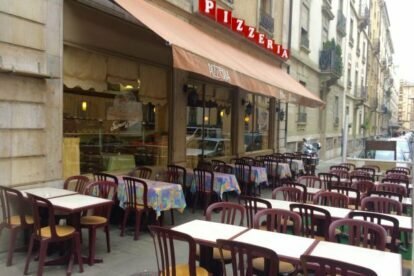 I used to live in a studio right above what is undeniably the best pizzeria in Geneva: Chez Marino. Life was not always easy but Chez Marino was always here to cheer me up. Chez Marino is not hip, nor trendy. You come to Chez Marino for their stunningly delicious wood oven pizza and for their amazingly nice and friendly waiters. It is a place where you feel at home, comfortable, safe and secure. Giuseppe, Domenico and Batiste made me feel like a queen, they greeted me every morning and every night with warm smiles. Chez Marino is the heart and the soul of Eaux-Vives, the social fabric of the neighborhood, a real anchor in the community. They know all their regular customers names. People keep coming back for more. The restaurant is crowded every night. On a nice summer day, sipping wine while eating my all-time favorite pizza the Paesana is a real pleasure of life. If you squint your eyes a little, you are transported to a little square in Noto, Sicily on a hot summer evening. When I had a hard day at work, or when I was feeling down, I would head to Chez Marino and all my worries of the day were gone. It was my dose of daily sunshine. It is more than a great pizzeria, it is home and it is family. They even offered to help me move out of my apartment!